Urban Boatbuilders’ summer is off to a great start! Our school partnerships have been launching their finished boats. 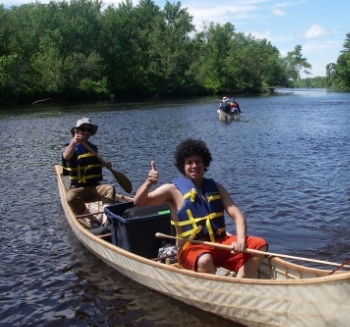 Our Apprentices took a great three-day trip down the St. Croix in canoes they built by hand. The workshop is bustling with activity every day, and many Apprentices have graduated from the program or are developing new skillsfor an additional six months as Youth Instructors. Our very first Youth Instructor, Mathias, who came to Urban Boatbuilders over a year ago, has graduated and is on his way to an exciting future. Mathias has changed dramatically from when I first met him in February of 2014. He went from a shy and retiring young man, nervous to speak in front of others and unsure of himself, to become a talented and conscientious leader, confident in his abilities and in his knowledge and welcoming to his peers. We will all miss Mathias, but we know he is going on to great things. Mathias is a clear example of the positive impact that Urban Boatbuilders creates in the lives of youth, and I am honored to have been able to witness his growth and the growth of all the other Apprentices who step through our doors each day. We have a lot more to look forward to this summer. Our Apprentices will be launching their boats in July, going on Urban Boatbuilders’ traditional five day voyage to the Boundary Waters Canoe Area Wilderness this August, and making memories to last a lifetime! All of this is possible because of your support. Together we are helping young people build bright futures. Urban Boatbuilders will have partnered with 14 schools by this fall, teaching boatbuilding to middle and high school students. Each class built an entire boat from scratch, and one by one the students have been thrilled to launch their finished boats into the water. Boys Totem Town, Murray Middle School, Nawayee Center School, Parkway Montessori Middle School, Park Highschool and Northeast Metro 916 have all launched their boats in the last month. These students built a total of four Wilderness Traveler canoes, as well as a skiff, pram and kayak. These freshly built boats hit the water at several lakes, including Lake Phalen, Keller Lake, and White Bear Lake. The students were all very excited to see the boats they had been working on for so long finally in the water and floating. After spending an average of 70 hours learning about fractions and how to measure and use tools, incorporating math, science and arts into the projects, the launching of each boat is a great success for the students. The students should all be proud of their accomplishments and everything they learned! This July, we are also excited to celebrate our Apprentices. The Apprentices will be launching their boats at Lake Como and the community will recognize their accomplishments. It will be a big day for the Apprentices, and a wonderful opportunity for their families to see what they have achieved. This June, Urban Boatbuilders is excited to be starting its first ever Right Track summer employment program. This partnership between Urban Boatbuilders and Right Track St. Paul has made it possible to run a summer boatbuilding and job-readiness program for 9 economically-disadvantaged youth who will build a canoe and a kayak together, and even learn how to carve oars. They will gain valuable skills, and participate in workshops about resume writing, job interviews, and apprenticeships in the trades. When the two boats are built, the students will have the opportunity to launch them during a celebratory ceremony, joining Urban Boatbuilders’ Apprentices at Lake Como, and see the tangible results of their efforts. After that, they will take their boats on a boating trip overnight down the Mississippi. The summer months can be difficult because young people do not benefit from the direction and support provided by school, and they can even lose some of the educational gains they made throughout the year. Urban Boatbuilders’ Right Track program will allows youth to keep learning and stay engaged, while gaining skills useful in the work world. The program is a great way for Urban Boatbuilders’ to keep spreading its mission of helping youth build bright futures one boat at a time. I learned about it from my school, Gordon Parks, and from my brother who had done the program a couple of years ago and said it was cool and would be good for me. What made you excited to work at Urban Boatbuilders? What did you want to learn? The chance to make things with my hands. I worked at Tree Trust before, but I wanted to learn how to make boats and also to get better at talking since I’m kind of quiet. What are you most proud of from being an Apprentice and from being a Youth Instructor? When I started, seeing how good I could make a thwart. And as a Youth Instructor I’m proud of working on the skiff and learning how to install the knees. How has being a Youth Instructor been different than being an Apprentice? Mostly in having to notice when people are slacking off and get them working. You can help others, and you get more respect. What has been the most challenging and the most rewarding about being a Youth Instructor? I’m proud of working on the skiff and getting past hard parts of the building process. What is your favorite tool in the workshop? The block plane and chisel. I like hammering off pieces of wood with the chisel. I want to work on bikes. I worked at Freewheel Bike, and learned how to fix the brakes. Are there any fun facts about yourself that you would like to share? I really like jumping my bike off of jumps. It’s what I like doing the most. Urban Boatbuilders recently went through a review with the Charities Review Council and we are excited to announce that we meet all twenty-seven of the Council’s Accountability Standards and have been awarded the “Meets Standards” seal. The Charity Review Council reviews nonprofit organizations in four areas: Public Disclosure, Governance, Financial Activity, and Fundraising. The review works to ensure that an organization’s operations, structure and policies meet widely accepted standards for accountability and transparency. The awarded “Meets Standards” seal shows Urban Boatbuilders’ commitment to accountable and ethical practices, and we are now listed as a reviewed organization on the Council’s Smart Givers Network and the Smart Giver newsletter distributed to households, businesses and nonprofits. On June 5, a crew consisting of four Urban Boatbuilders instructors and four Apprentices set out to camp and paddle along the upper north section of the St. Croix river near Danbury, Wisconsin. The trip took place over 3 days and spanned approximately 30 miles. On the final day, Urban Boatbuilders volunteers and other Apprentices met up with the crew along the river to paddle the final, rapid-filled, stretch. This trip marked numerous highlights for the Apprentices. For Mathias and Grant, it served as a culminating event as their six-month Apprenticeship came to an end. For Darren, this provided an opportunity early on in his Apprenticeship to learn how to paddle and test the boats he has helped craft. For Joe L. And Joe G., the trip served as a time to celebrate new and positive experiences outside of the normal daily routine. When I asked our Apprentice Darren what he liked the most about the trip, he said: “It was awesome! The best part was all the canoeing and getting to know everyone.” A second notable quote from the trip was from another Apprentice. Joe G. said, "I don't know what it is about being out here, but it makes me feel really good inside. It has something to do with not feeling rushed and hurried like at home." These quotes resonated with me because they helped me realize what these boats serve as: tools to develop long-term employment skills, and also vessels for a fresh and positive outlook on life. Urban Boatbuilders will be celebrating the accomplishments of our Apprentices at Lake Como this July 29th. The Apprentices will launch the boats they built during their Apprenticeships. Our Right Track program students will also be launching their boats. Urban Boatbuilders will be present at the State Fair for our second year. Apprentices will be demonstrating boatbuilding techniques as they build a new boat from scratch over the course of the fair. We will be displaying by the DNR Fish Pond once again, so plan to stop by for a visit!